By keeping track of current market development, we are into offering an excellent range of Remote Control Jack. Pipe lifter is used in application to lift the pipe during installation of India mark-II hand pump. Power Tools & Tackles Was established in 1992. In 17 Years It has grown in to one of the Leading distributor for construction Industries. 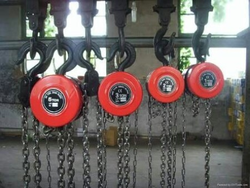 We have made available the Lifting tools and other equipments and documented accordingly.